If you’ve spent time in the NoHo Historic District and Extension, then you’ve probably notice that there are two highly visible voids in the short stretch between Broadway and the Bowery — a destination that has become one of the city’s most interesting and admired architecture ensembles. The city is about to get a new architectural gateway in this locale, situated at the intersection of Lafayette and Bond Streets. The new gateway will consist of two quite similar, small, new residential buildings designed by different architects on the north side of Bond Street. Sometimes a gateway can consist of a single element such as the Roosevelt Island Tram designed by Prentice & Chan, Ohlhausen in 1976 at 60th Street and Second Avenue, the grand colonnade at the Manhattan entrance to the Manhattan Bridge, and Cesar Pelli’s grand Wintergarden with its bamboo trees to the west of the World Trade Center. Other major individual gateways are the drive-through 230 Park Avenue, the ramps around Grand Central Terminal, and the demolished and greatly lamented Penn Station. The terminal led to the homogenous development of the surrounding area known as Terminal City, now largely vanished with the exception of the Roosevelt Hotel. However, the demolition of Penn Station did lead to the (very belated) creation of the Landmarks Preservation Commission. In other instances, it can be two structures such as can be found on either side of the Channel Gardens in front of 30 Rockefeller Plaza, or the two very similar trifoil apartment towers designed by Philip Birnbaum on Third Avenue and 61st and 62nd Streets which open up a path to the Upper East Side. The gated entrance a couple of blocks east on 116th Street is another very handsome gateway that leads to Columbia University. 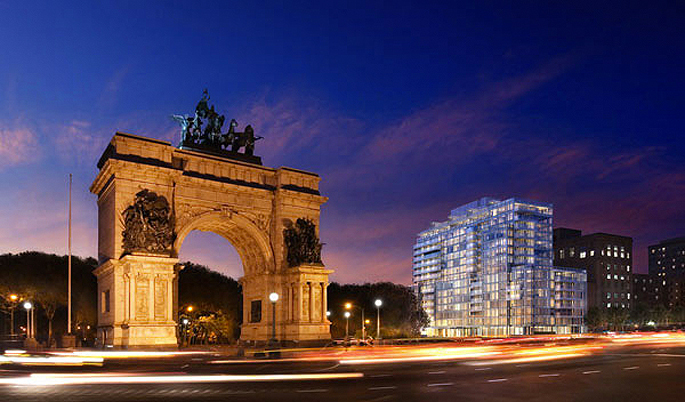 It can also be a group of structures centered about a major intersection such as can be found at Columbus Circle at the base of the Upper West Side, or Brooklyn’s Grand Army Plaza, now minus its northern trees. 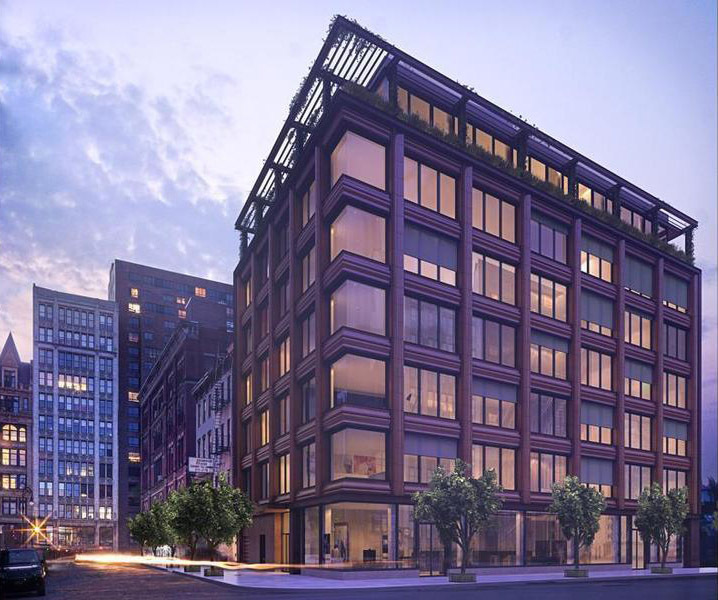 The 7-story building now under construction at 10 Bond Street at the northwest corner at Lafayette Street has been designed by Annabelle Selldorf, the architect of 200 Eleventh Avenue, for SK Development, the Ironside Development Company and the Chetrit Group. When it opens next year, it will have 11 co-operative apartments consisting of a townhouse unit, 9 two- and three-bedroom apartments and a penthouse. The site was formerly used for gasoline stations and car repair shops. 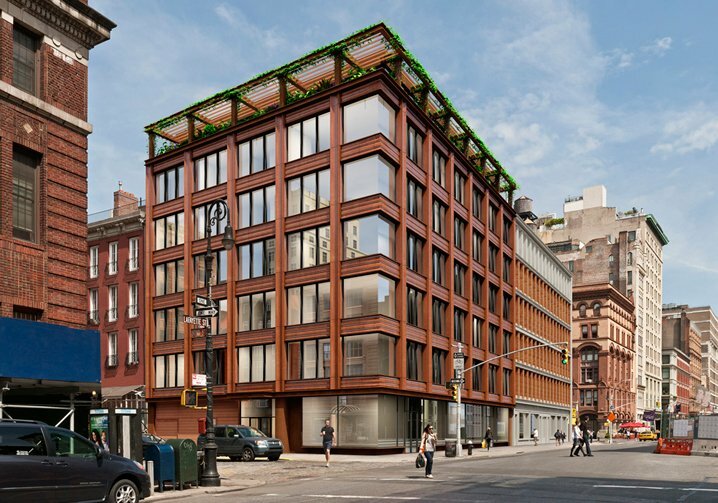 The building is notable for its corner windows at Lafayette Street, a rooftop pergola on Bond Street and its large windows framed in a red terracotta façade with exterior shading blinds. A lower level fitness center overlooks a sunken landscaped plaza. Across Lafayette Street, construction is advancing on a slim, 6-story building at 372 Lafayette Street designed by Morris Adjmi that is quite similar in fenestration and massing to the Selldorf building, although it employs a different palette and different materials. A previous plan by David Wallance for the site that once contained a one-story garage built in 1933 called for a 6-story building composed of orange-colored shipping containers, a plan that was never built. According to a 2011 article in the Greenwich Village Society for Historic Preservation blog, the design approved by the Landmarks Preservation Commission for the Adjmi site has red brick piers “that follow the vertical lines of the aluminum” façade, “getting smaller was they move upward.” Adjmi’s other recent projects of considerable note at the Sterling Mason condominium, the torqued roof addition to 837 Washington Street, 250 Bowery, and the extremely handsome headquarters of Scholastic Inc., a red-girder tower with white column framing on Broadway between Prince and Spring Street. The two new projects are a gateway for the two-block cobblestone stretch of Bond Street that contains some very lovely older buildings such as the former Brooks Brothers Building of 1874 at 670 Broadway, designed by George E. Harney, the Stephen D. Hatch Second Empire building at 1-5 Bond Street with its many Corinthian cast iron columns, and of course some spectacular and very fine modern buildings such as Herzog & de Meuron’s 40 Bond Street.